Ian Chapman thinks everything is where it should be and there is no need to panic. 'Picture by Steve Robards. Burgess Hill Town manager Ian Chapman has reiterated that it is not yet time to panic, following two defeats and one draw from their first three pre-season games. 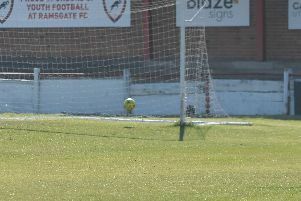 A 0-0 draw to Eastbourne Borough last Thursday was followed by a 2-0 defeat to Horsham on Saturday, meaning the Hillians are still yet to score in their pre-season campaign, and Chapman blames poor finishing rather than a lack of chances. He said: “We’re not scoring goals yet, we need to find a way of scoring goals but against Eastbourne we looked solid and we created chances. The Brighton-born, former defender is not concerned by the lack of goals, but is keen to see his players show more confidence and decisiveness when presented an opportunity. “Of course we want to score goals. There’s no denying it was disappointing on Saturday but it is pre-season. “We still created around four or five chances that we should have scored, good chances not half chances, we should score. “Even against Eastbourne we had a great chance late on, 1 on 1 with the goalkeeper, but in training we haven't done any of that yet. Chapman again emphasized the importance of fitness as the new season approaches, while he also confirmed he has nine or ten players in mind for his starting line-up for the first league match next month. He said: “We’ve got to take our chances and work harder. I want to get us really fit this year. When we played our full strength side out against Eastbourne Borough, it’s really positive what I see. “I thought it was decent, we’ve got loads to work on and give people time. Chapman hopes to have two or three more signings come into the squad for the new season, but he would prefer any business to be completed within the next two weeks. “The next two weeks are important, we want to have a squad ready and have everyone here so it should be another 12 days or so and we’ll hopefully have two or three more players. Burgess Hill’s pre-season campaign continues on Thursday against Whitehawk, and Chapman confirmed he will play a “strong side”. The Hillians face neighbours Hassocks in the annual Ann John Memorial Cup at the The Beacon on Wednesday, July 26th.